The IBM® Maximo® for Service Providers product is designed to support Service as a business. It helps lower total cost-of-ownership and increase profitability and customer satisfaction by managing clients' assets either through third-party outsourcing or internally shared services model. 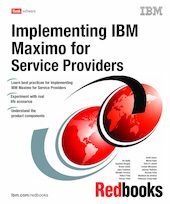 This IBM Redbooks® publication introduces IBM Maximo for Service Providers product and its components. We took a practical approach in this book, and presented the features and functions of the IBM Maximo for Service Providers product in the context of a number of real-life scenarios or usage patterns. These scenarios are commonly used at IBM customer sites to satisfy specific business requirements. For each scenario, we establish the business reason, benefits, and how to implement the scenario. There is also a section on initial product configuration that touches on several configuration points, such as creating the customers, security groups, and response plans. This book is a reference guide for IT Specialists and IT Architects implementing IBM Maximo for Service Providers.